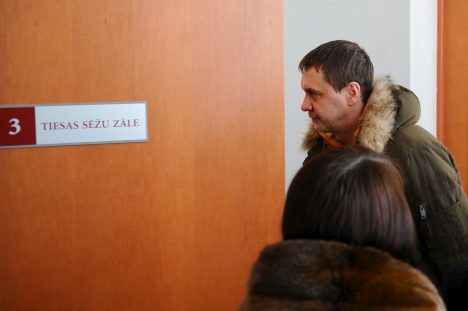 Zemgale District Court in Jekabpils has decided to postpone viewing the criminal case in which former Daugavpils vice-mayor Vjačeslavs Širjakovs and businessman Sergejs Karnauhovs are accused of bribery worth EUR 60,000 until February 2019. The court commenced viewing the case in October. There has been only one court hearing so far. Initially it was planned to continue the court process in November. However, according to court representative Sanita Grinšpone, representatives of the accused party requested postponing the viewing of the case until 7 February 2019. Māris Leja, prosecutor of the Prosecutor General’s Office’s Division for Investigation of Especially Serious Cases, raised charges against a member of Daugavpils City Council for accepting a bribe of EUR 60,000. According to the prosecutor, the bribery took place At Daugavpils City Council 1 February 2013. The bribe was given to provide a private person with a beneficial outcome in the decision-making process for the signing of a contract between a private company and Daugavpils municipality’s institution Public Utilities Office on the maintenance of the city’s streets in 2013-2015. Leja found out that the bribe was given to make sure the decision was favourable to the represented company. Criminal charges detail several procurements, with the biggest one being one being the aforementioned contract for street maintenance, where the total funding amount was approximately EUR 7 million. Considering that the case contains only one episode and two witnesses, Leja hopes the curt process does not take long. The accused deny their guilt.